The larvae of this species are often attended by ants from the following genera: Camponotus, Iridomyrmex and Rhytidoponera. Larvae chiefly feed on the flowers of various species of legumes including Cajanus spp., Galactia tenuifolia, Indigofera pratensis and Vigna lanceolata. Mature larvae pale-green or pinkish-green with prominent purplish bands. 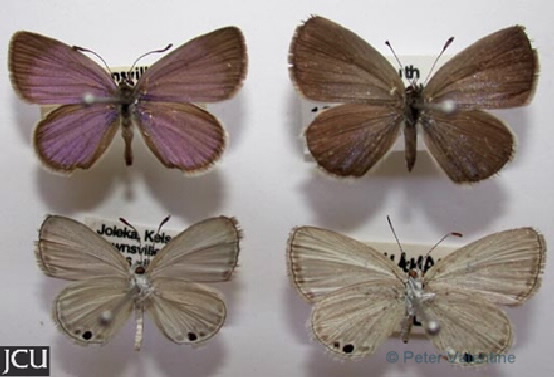 Adult male purplish lilac, outer edge of fore wing with a broad band of brown, hind has a narrower band; female brown with basal and central areas pale blue on both fore and hind wings; lower surface pale grey some whitish rings towards the outer margin, hind wing with prominent black spot.